I guess you're Fred's non-official co-reader then. Has your Witsen-copy arrived yet? I am still waiting for Fred's 'Filosophy'. I am not that familiar with 19th century American ship building practice, but I suppose the 19th century MacKay sloop was built in the English way. 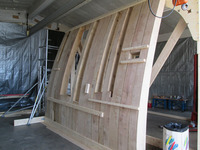 I guess that would mean that the sloop is built with the standard English double framing, what would account for the complete filling of the hull with framing timbers. Or is the framing more random? Is there an internet link to the archaeological site, so I can have a look? Or do you have a picture of your reconstruction? Would be great to see. Engish practice was also, contrary to the 17th century Dutch practice, that the stern faced the water when the ship was built. But, regarding your remark about the ship being burnt to obtain its fasteners, I guess this ship was landed to be demolished? If so, the question would be: did they land the ship bow first, or stern first to demolish it? Please correct me if I got your whole story wrong. Will have Witsen later today. I will create a new post in the general board for this, since it is not directly Vasa related. But will leave a small word on Essex. Even though what is left of the hull is pretty solid, the timbers are not all the same size. They vary quite a bit. 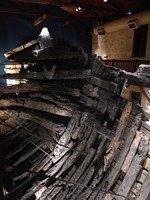 Pictures show the ship bow first prior to burning, but after studying the remains closely, it is likely that the currents have flipped the remains around (or the burners did) and it now rests stern first. Just to keep the thread alive, the next bit of the 1629 'certer'. And that's all for the stern post. Would be interesting to know how this compares to Vasa. I wonder if what ever I designed for my Vasa 1:48 scale is realistic ? Last week being in the Nederlands and I notest the disposal on the keel frames by " 7 Provincien " replica wich are to be seen at Lelystad . There I whitnest dfiferent disposal of those framaes . 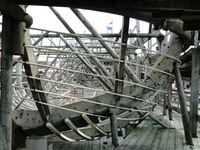 Considering the fact both " 7 Provincien " and " Vasa" are dutch design boat I wonder whay the frames are different ? I'm not wuite sure whetherI understand your question. Fact is that wasa and the reconstruction of the zp are quite different. vasa is much earlier, tha ZP. Also, Wasa was build shell first, while ZP is build frames first, using a system in which a number of frames was erected first, and next these ar complemented, usi g battens to check for the size and form of the frames. For the first , I went to Holland to study the dutch building technology of the old ships from XVII-th Century and not at all to compare Vasa and 7 Provincien which would have been a stupid thing to do . Second , I intend to write a book about Vasa 1628 with drawings for modellship enthusiasts . 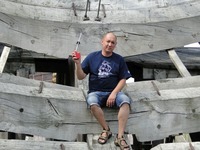 As well to build a ship model 1:48 scale of the very same ( arsenal model ). My question to Fred Hocker concerned the differences between the frames . Studying several ships from the same period I observed differences in the way the frames were attached to the keel. Some of them as 7 Provincien were assembled trough a "channel " carved in the frames while others as Vasa presented no "channels". I understood you are an " amateur" :-))), but have you got a name as well ? But still, your questionsuggests that you are comparing building styly of ZP and Wasa..alets wait for Freds answer. And normally, i sign by name , must have slipped out in my precious post. Vasa and ZP differ in their framing and construction sequence largely because of the difference in age. The bottom-based method used in Vasa was largely abandoned for large, seagoing ships by the second half of the 17th century in favor of the frame-based approach seen in the current ZP reconstruction. 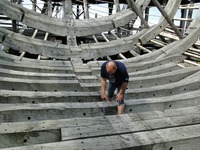 When the ZP project started, it was being built in the early 17th-century manner, with the bottom planked out to the turn of the bilge before floor timbers were inserted, but this was all torn down and a frame-based method used when the ZP project was reorganized in the 2000s. Dutch shipbuilding is not monolithic, it changed over time and had a lot of regional variation as well. The bottom-based method is most often associated with the northern Netherlands, while ships farther south favored a frame-based methodology (although as Jules will know, that is a gross over-simplification of the reality). An important difference to note between Vasa and the ZP reconstruction is that ZP is using made frames, with the futtocks fastened to the floor timbers so that entire frames can be erected at once. In Vasa, there are no connections between any of the frame timbers, each element is independent. In addition, the frames are not generally square to the keel, either athwartships or vertically. 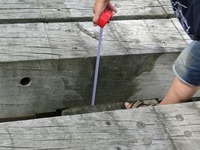 There are different numbers of futtocks and top timbers on the port and starboard sides. Thus Dorin's digital model with continuous frames of even dimension is quite far from the reality. It would be quite difficult to build an admiralty-style model of Vasa. As Kroum Batchvarov, who has been recording the frames, likes to say, model builders will hate us. The following image shows something of the framing amidships at the level of the lower gundeck (this is the partial reconstrucion we made as a cannon target). One can see that the timbers are of irregular dimensions, the futtocks end at different heights, there are extra futtocks in the way of the beams, and there are no real joints between timbers. In addition, these timbers are somewhat more regular in their shapes than those on the ship. The original floor timbers and futtocks have substantial areas of sapwood and bark on them, and a fair amount of wind. By the way,do you think I could extract from the plan below the right dimensions necessary for my project? I would be extremely grateful for your expertise. To illustrate what Fred said on frane parts that are very irregular, and not connected to each other, you can take a picture of Batavia, build in around the same time as Vasa as an example. This is a picture of the inside of the wreck in Australia. It is very difficult to recognize separate frames, it looks as if the whole inside of the hull is just covered in timber. Thanks for your advice! Although I know that it´s an important point. This picture below gives me much food for thought.